Go Hydrology! : This slice of swamp has a mind of its own! This slice of swamp has a mind of its own! Particularly after we have a big “dry season” rain. as seen just days apart. On the "before photo" (April 19th) I searched even deeper into the dome, i.e. beyond the pond apple, to find water and eventually found it in an alligator hole. In the "after photo" (April 27th), on the other hand, I did all that I could to stay out of the water and keep my boots dry. It was a long day ahead and didn’t want wet socks! It looks like a similar before and after photo, too … right? and the other wet season wet ... but why? The surprise answer is no! Both photos were taken in identical and adjacent dwarf-cypress marl prairies along Loop Road on the same day a few weeks ago. As you can see, one is bone dry and the other is practically “wet season” wet. The short answer is I don’t completely know. 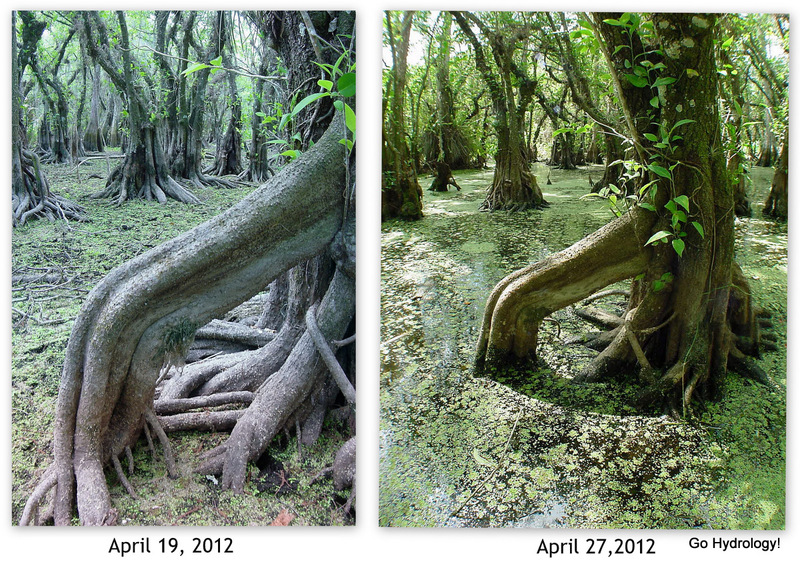 Here's a look a the alligator hole where I found water on an April 19th, i.e. before the rain, when the rest of the pond apple forest was completely dry. The top photo shows it in the distance across a quaking type bog that was unstable, i.e. jiggly, to step on. 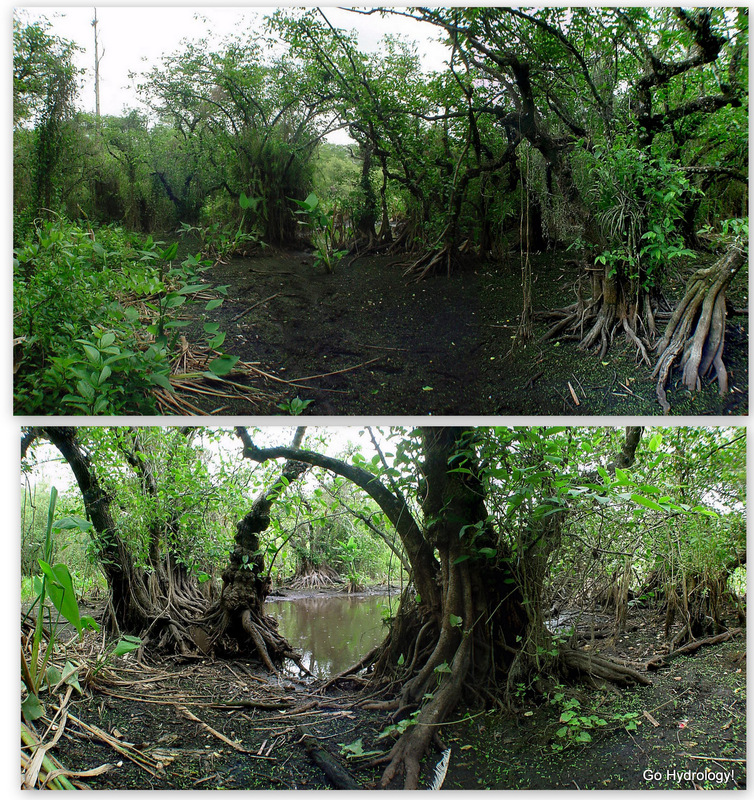 The bottom photo shows a closer view of the same water. During the summer and fall this spot is too deep to approach. What I suspect is that water is back flowing in across the levee from an adjacent Everglades connected canal. The water could also be the result of pooling at the downstream end of a long north-south running canal. I liken those situations metaphorically to the Robbing Peter to Pay Paul parable – the canal is able to send bountiful water to the south (to the flooded prairie) by stealthily over-draining wetlands adjacent to the same canal to the north. To be sure, this water isn’t disobeying any water management rules. 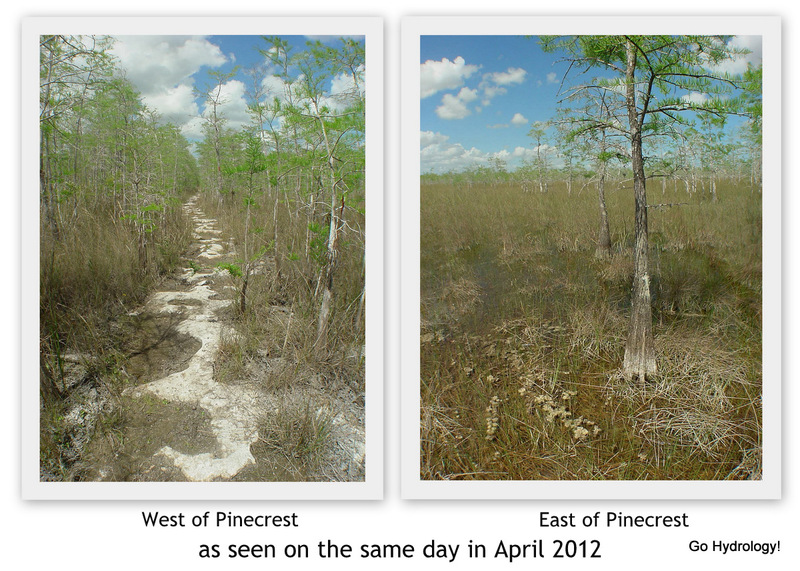 In fact, The Big Cypress welcomes water with a mind of its own.